SCRANTON, Pa. -- The widow of a Pennsylvania state trooper has sued the parents of a man convicted in her late husband's killing. Tiffany Dickson, widow of Cpl. Bryon Dickson II, says in the wrongful death suit that Eugene and Deborah Frein psychologically manipulated their son "into developing a strong dislike for police and acting on that dislike." 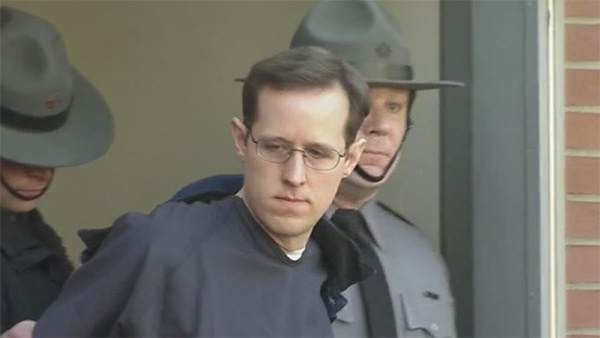 Thirty-four-year-old Eric Frein was living with his parents in Canadensis when Dickson was fatally shot and Trooper Alex Douglas was wounded outside their barracks in 2014. Frein was caught after a 48-day manhunt. He was convicted of murder and sentenced to death in April. An attorney for his parents didn't respond to calls from newspapers that first reported the lawsuit. The couple also didn't immediately return a call Monday from The Associated Press.